The genesis of the Workshop for the Blind & Visually Impaired came in to being in 1965.The Salvationists at the time saw there was a need for a program for students, who were idle at home with nothing to do after the completion of their formal education. The goal was to teach these students vocational skills with the hope of one day making the employable. At that time there were little to no opportunities available for visually impaired persons in regards to employment. In the beginning of this new venture, students were being taught how to make brooms and cushions, because of how expensive the materials were for these products those items were eventually phased out. In the 1970’s the introduction of producing began at The Workshop. The commercialism of these mops first started in the 1980’s. 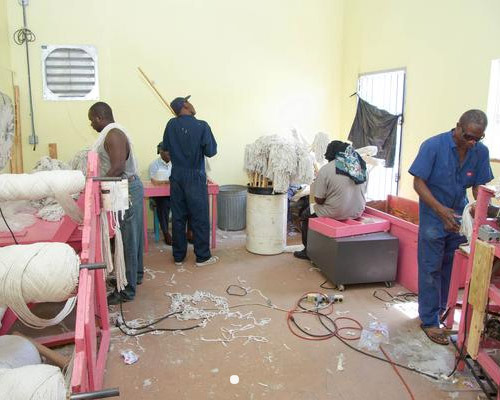 For well over three decades, The Salvation Army Adult Blind Center and Workshop has been producing high quality, durable mops that supplies government agencies, schools, hardware stores, food agencies, hotels such as Atlantis, Super Clubs Breezes and many more business establishments. Our mops last up to then times as long as conventional cotton mops. It has built-in-anti microbial protection that stops growth of microorganisms that can rot and shorten the life of regular mops. The Workshop gives blind and visually impaired adults the opportunity to work with dignity and pride. Every employee receives full and equitable pay for their work, while gaining a sense of self-reliance and independence. Some of our net profits go back into the community through the Army’s social services programs. Through gifted hands we are breaking the barriers of disability in an amazing way.